In September we posted a blog about BPA Free Sports Bottles. There was some concern after the Journal of the American Medical Association concluded from a recent study that BPA may be harmful to adults with high levels of the chemical in their blood. However, the FDA made a statement that products on the market contain low levels of the chemical and do not pose health risks. A recent update on the BPA safety was sent to the promotional products industry last week. Once again the FDA stated exposure levels are low and will not affect the health of adults or children. The full article is below. It’s hard to determine what is safe and what’s not with the conflicting news we receive everyday. That’s why Garrett Specialties offers a wide selection of Promotional Sports Drink Bottles to meet any of your marketing needs. Juice up your promotion with BPA Free Eco-friendly Bottles. Sporty, durable, quality water bottles won’t dry out your budget at $1.00 or less. 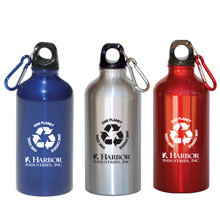 The hottest trend on the market for earth friendly, recyclable, safe, and re-usable water bottles is the Aluminum Bottle. It is a great alternative to plastic bottles. It’s attractive, different and new. It’s durable and can be used over and over increasing your brand identity each time. The aluminum bottle shown above has a carabineer that conveniently attaches to your belt loop or backpack. Through its decision, the science board (a group of outside experts), said that the FDA was wrong to base its decision solely on industry-funded studies – in the process ignoring other research with more damaging conclusions. The FDA declared three months ago that BPA (commonly found in reusable plastic water bottles, baby bottles and the linings of metal cans) was safe in trace amounts. But since then, BPA has come under repeated attacks. A September study published by the Journal of the American Medical Association linked it to heart disease and diabetes. Another study last month by the National Toxicology Program suggested that BPA exposure to expecting mothers may cause alterations in brain, prostate gland and behavioral development in fetuses and children. In a statement Wednesday, the FDA stood by its initial decision over the safety of BPA: “Current levels of exposure to BPA through food packaging do not pose an immediate health risk to the general population, including infants and babies.” However, FDA director Andrew von Eschenbach has stated the agency will revisit its decision in light of last week’s ruling.